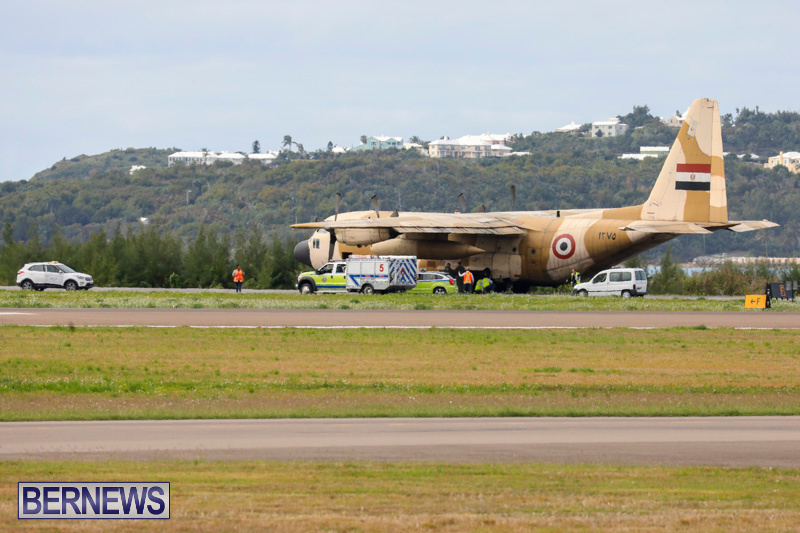 Bermuda Fire and Rescue Service spokesperson Sergeant Allan Wilkinson said, “At 10:20am this morning, the tower personnel at the LF Wade International Airport noticed a rear tire on the portside landing gear rupture while making a scheduled landing. 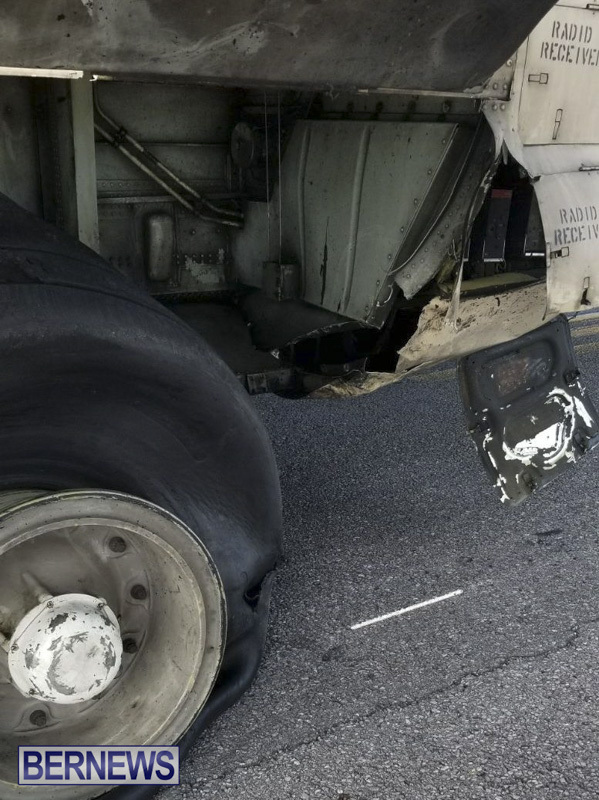 “The rupture cause smoke and debris to be scattered on the runway, resulting in the airfield being shut down for approximately thirty minutes. 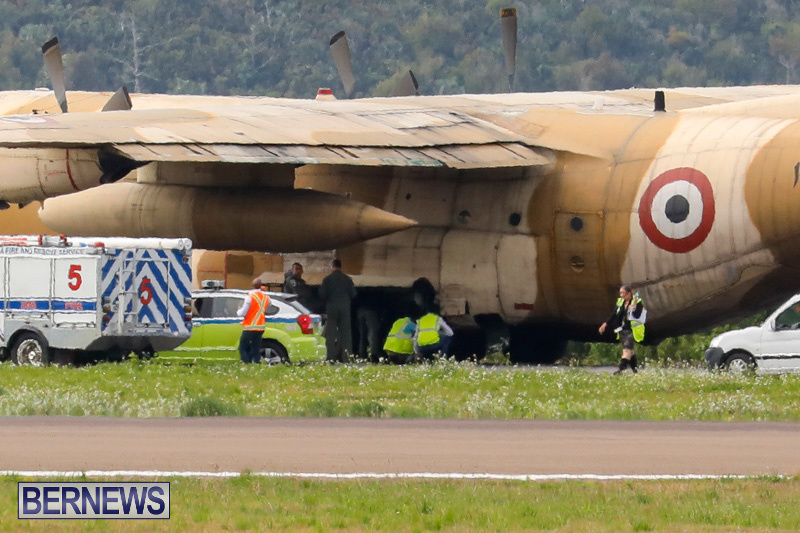 The C-130 was carrying fifteen military personnel on board the aircraft. 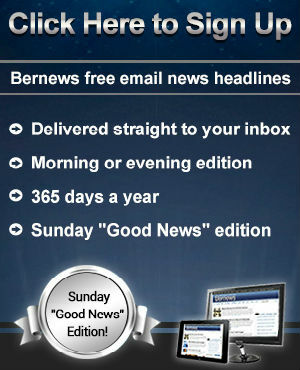 “The Bermuda Fire and Rescue Service were promptly alerted and responded to the incident with seven appliances and twelve personnel. “Thermal imaging equipment was used by the Bermuda Fire and Rescue Service to determine if any additional hazards were present. 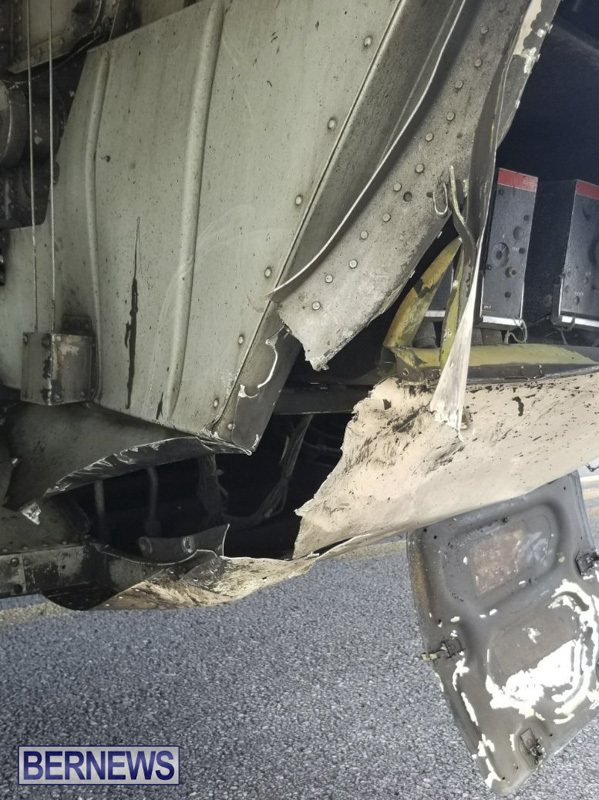 “The debris left on the runway was cleaned up by the Fire and Rescue personnel and the airport support staff, resulting in the airfield being re-opened at approximately 10:50am. 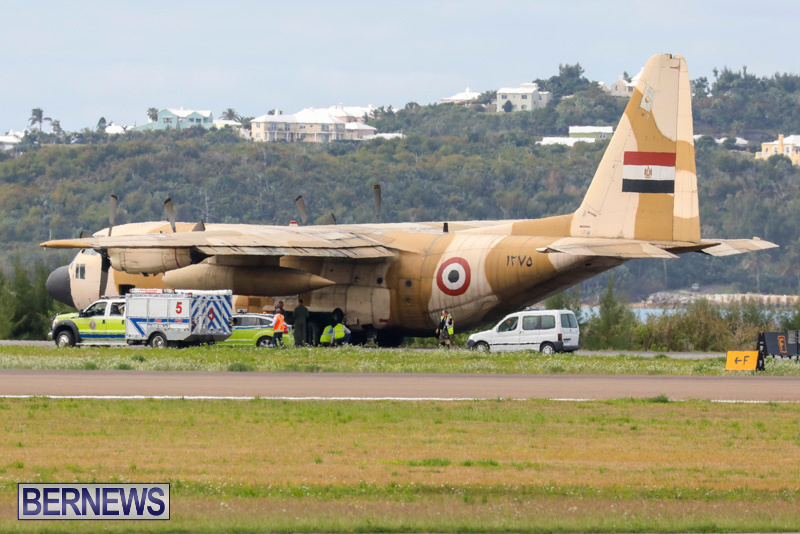 Not the 1st time the Egyptian C130′s have burst a tyre at Bermuda Airport. Do military aircraft like these carry their own spare tires, or do they have to wait for a vendor or the like to fly a replacement in? 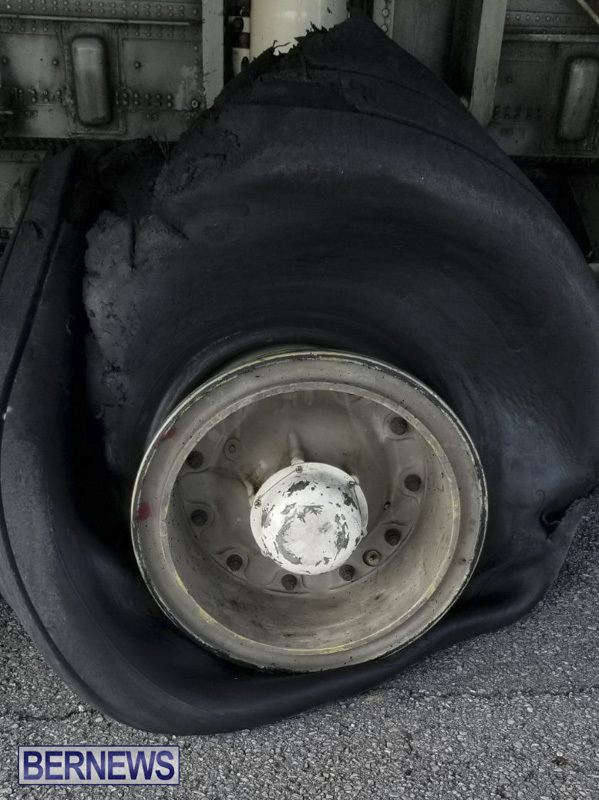 Because that tire looks absolutely shredded, can’t see a repair on that. Mostly they will carry a spare. A rupture, however, is only part of the issue. The Engineers must also determine whether there is structural damage to the airframe. That damage should buff right out. Check with the new tire shop down there. They should be able to hook them up. Can someone tell me why the Egyptian Air Force are frequent visitors to Bermuda. I understand it’s likely a fuel stop but why are they crossing the Atlantic? Maintainence? Training in the US? Interested to know. 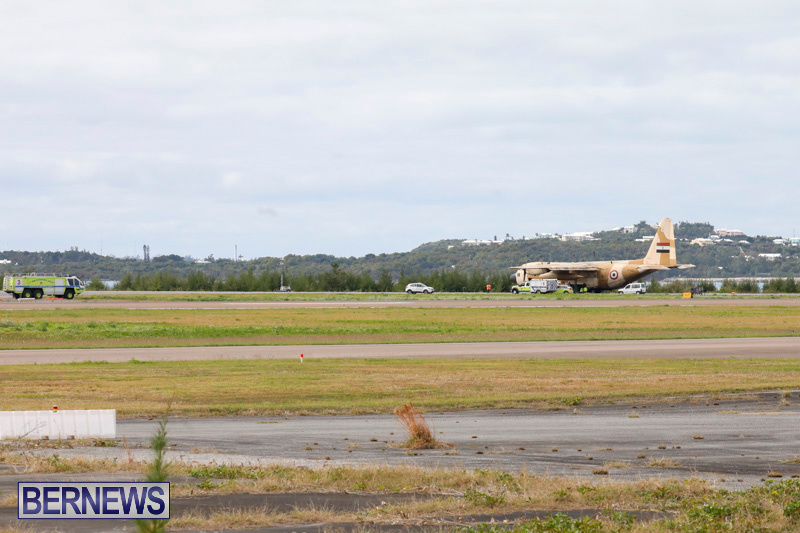 Fact:they are doing a regular shopping run,Bermuda Airport is quite used to them. Usually carrying diplomatic mail/packages between the US/UN and Egypt. George that’s a dumb question, ya gotta be a child. Why is it a dumb question? Given your vocabulary and spelling issues you may want to review who is the dumb one here. pretty good point – Many Egyptians are askin the same!! Cardossos can fix that up nice and fast. Why they cross – Guantanamo. But the state of that plane – maintenance as are US supplied. That is some serious damage to the wheel well housing and outer frame. Can’t fly all the way back home with you wheels down. Nothing that a little 300mph tape won’t fix. Get it at Gorhams. Don’t know what 300mph tape is? It is 2″ metal tape developed during WW2 to patch up small bullet holes. 300mph was about top speed for aircraft at the time. Good stuff. Better than duct tape. No glue residue when peeled off. ya full of it ! Over the years I’ve seen 2 different types . One is like heavy duty sticky tin foil and the other is what you can find in any of the maintenance/repair shops of the airlines here. The type the airlines actually use is like a lighter weight aluminium sheet that the planes are built of. This would be used if an aircraft sustained a punctured skin while on the ground and being serviced by baggage loading/unloading crews or maybe catering trucks. The problem for the airlines is that it’s a temporary repair and the plane would have to be ferried back (empty of passengers)to the base overseas for a proper fix. It sticks like nothing else . Egypt ‘S media are tight lipped about the embarrassing incident.